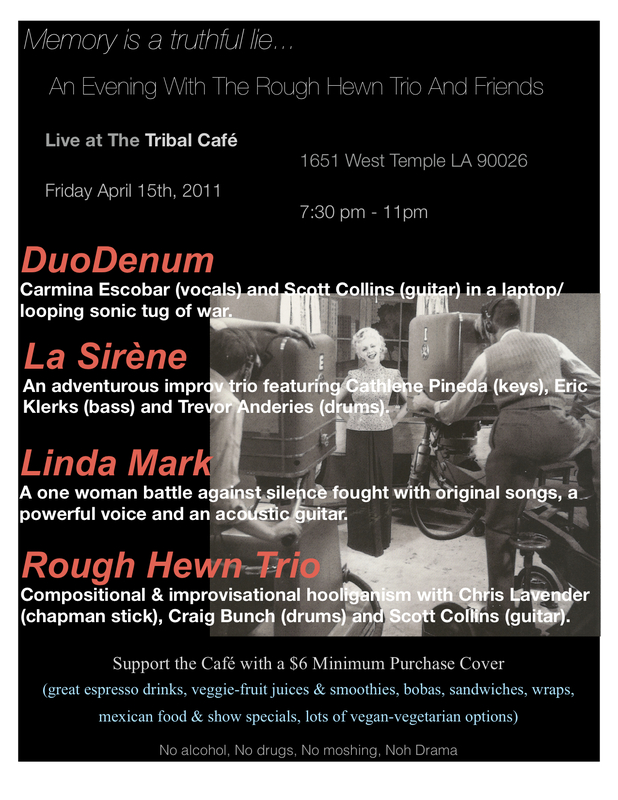 The Rough Hewn Trio will be performing on Friday, October 14th at the Tribal Cafe in Echo Park/LA, CA. Coming off of a recent recording stint, we’ll be bringing rough-hewn originals and raspy renditions of fine European craftsmanship. Other guests – TBA – You may see a short Dumb and Drummer set and a solo acoustic set by me is a strong possibility as well. If you’re in the LA area, and like improvised dreamlike textures, cartoon music or odd time Balkan tunes churned through an instrumental trio drop on by. If you’re in the area it should be a lot of fun! Just a final plug for a show that’s happening tonight Friday, July 15th at the Tribal Cafe in Echo Park/LA, CA. Dumb and Drummer is a duo I have with Rough Hewn Trio drummer Craig Bunch that’s been playing off and on for the last couple of years. We keep threatening to record something and will finally be doing so this summer. Typically the sets are 100% improvised, but tonight we’ll be playing tunes – so it’ll be a 50-50 mix. There’s a country-ish tune, a hindi inspired jam and an Enigmatic freak out in the works. We start at 8pm. Rough Hewn Trio is also slated to record some things this summer. Tonight we’ll be bringing some Balkan music, a Hungarian fusion workout, a new Malian guitar inspired re-working of Bloodsucker, Lavender’s 232 and a Zappa-ish original, Jerry goes to Frankiewood. If there’s time we may get an encore in. This starts at 9:45 ish. And of course, King Courtney will be putting up her dukes and playing with them as well – so expect her band to come out swinging at 1/4 to 9. Yes – Carmageddon starts at midnight tonight – but we’ll be all tucked away by then and hopefully so will everyone else there. This is the last show on the books for the next month or two while we get into the studio and knock out some tracks. Hope to see you there! We’ve booked a couple of shows around Chris’ summer tour with Martin Fabricius and Craig’s ongoing tour of regional correctional facilities. Here’s the info for the Irvine show from Chris. This is going to be a really cool recital that will feature audience members playing with the band using Chris’ Thumbafon iphone ap. This is the penultimate performance of my graduate work, which is centered around the investigation of using mobile devices as a means toward audience collaborated performance. It’s an epic social/musical experiment* that YOU WON’T WANT TO MISS! Checkout www.thumbafon.com for information on the iPhone App which will be used during the performance. Just a quick plug for a show featuring not one but two groups I’m playing in that’s happening Friday, April 15th at the Tribal Cafe (1651 West Temple Street Los Angeles, CA 90026-5026 (213) 483-4458) from 7:30 pm – 11 pm. 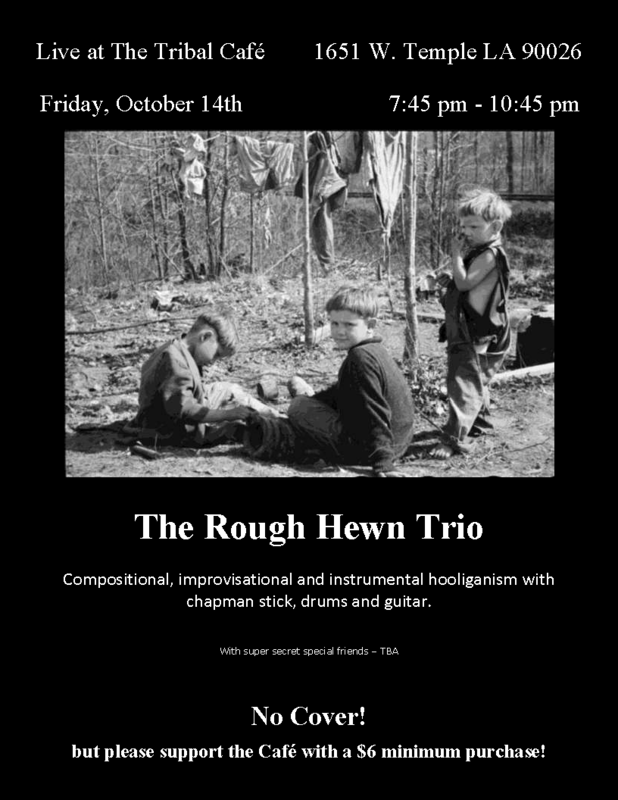 The Rough Hewn Trio – an instrumental trio consisting of Chris Lavender on Chapman stick or Warr guitar, Craig Bunch on drums and myself on guitar will be playing a combination of pre-composed and improvised material. To get a feel for what the shows will be like here’s an mp3 of a live excerpt from an improvisation we did this fall (now an actual composition called bloodsucker). I’ll also be performing in Duodenum, an improvising duo with Carmina Escobar. You can get the general vibe of the performance from this improvisation with Mia Mikela (aka solu) or this clip or from this one. The show will also feature the phenomenal talents of both La Sirène (An adventurous improv trio featuring Cathlene Pineda (keys), Eric Klerks (bass) and Trevor Anderies (drums) (a recent mp3 is here) and Linda Mark (some mp3s of her band Dorothy Feels is here). Mp3 playback is sometimes a little glitchy in Safari. If it doesn’t play in your web browser – you may just have to reload/refresh the playback page.